HERO ACADEMY returns in an all-new sequel that’s bigger, faster, and more tactical than ever! Create your custom army from tons of medieval characters and factions! Fight real-time PVP arena battles. Compete to rule dozens of battle boards in the ultimate combination of tactics and strategy! 5 million downloads later, the award-winning franchise and Game of the Year returns in all-new sequel that’s bigger, faster, and better than ever. Build your army, then outwit your opponent on the battlefield with chess-like precision! Control of your team combines with movement-based tactics in the ultimate 2-in-1 combo. Enter the arena to fight friends and foes in fast, turn-based battles. 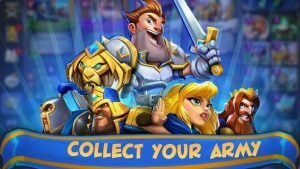 Choose from hundreds of Hero Academy’s trademark warriors, wizards, spells, and shields across multiple factions. ENJOY MEDIEVAL MAYHEM: EASY TO PLAY. HARD TO PUT DOWN. Hero Academy 2’s combination of deck building and boardgame-like movement makes the game easy to understand and provides tons of strategy variations. Hone your deck and test your skills. Explore the Academy in single player campaigns and missions. Build your deck and team with every victory. Crafting makes every win meaningful and rewarding! New monthly seasons give tons of chances to climb the leaderboards. Constant updates bring new arenas, characters, and battles.